Dear Friends,Part 1: Are You a “First-Class Noticer” of Wide-Moat Compounders? Part 1: Are You a “First-Class Noticer” of Wide-Moat Compounders? “Are you free now?” N asked me in a pensive mood when our paths crossed in a chance encounter in the underground basement of the Singapore Management University. N, a SMU accounting student taking the course Accounting Fraud in Asia, and his friend Chris have started a mobile app company which had developed an Uber-like mobile app to assist us to beat the long queues in healthcare clinics. When I listened to N explaining his app, i immediately shared with him the Japanese innovator M3 Inc (2413 JP, MV $6.6bn). M3 is an overlooked wide-moat Bamboo Innovator I wrote about in 2012 and shared with the CEO and top management team of a listed tech company in a series of workshop “Uprising! With Bamboo Innovators: Business Model Innovations and TMT Industry Trends” conducted in Singapore, HK and Beijing in 2012/13. M3 has since tripled to $6.6 billion. M3’s popular iTicket (www.iticket.co.jp) internet and mobile service used by more than 500,000 members to make reservations at clinics and beat the long queues might have some relevance for N to articulate the business model to seek funding – and clarity in their own execution and scalability. Both Chris and N have never heard of M3. I explained briefly to them that M3 started out like a Google for medical professionals, with its core MR-kun service used as a marketing tool by pharmaceutical companies to provide consistent, repeated delivery of information on products and diseases. MR-kun also provides a channel for companies to receive questions and feedback from doctors, strengthening company/doctor relations. With support by Sony Corp subsidiary So-Net which retains a 49.8% stake in M3, Itaru Tanimura established M3 in 2000 when he was 35. Essentially, M3 recognized that the demand for eDetails is quite high for busy physicians who require timely information at their convenience, without the limitations imposed by their off-line MRs. Doctors spend the most time collecting information via the Internet. Conversely, pharmaceutical firms spend the majority of their budget on MR related costs – and Japanese pharmaceutical firms’ huge marketing cost of ¥1.2-1.5tr ($10-12.5bn) is not sustainable. Pharmaceutical companies signed up for MR-kun pay a basic annual fee of ¥70 to ¥100 million ($0.58 to 0.83 million) per electronic “e-detailing message,” which is the online equivalent of a sales visit by a MR (medical representative) to a physician’s clinic. In the pharmaceutical industry a sales visit by an MR to a doctor’s clinic is called a detail. M3 also charges fees for the production of promotional content and receives fees for other services such as facilitating the exchange of messages between pharma company MRs and their physician clients. The average of M3’s top five clients pays ¥860m ($7.2m) every year. A dominant platform used by 80% of Japan’s physicians, MR-kun is rated by over 92% of its users who said its usage “deepened their knowledge of diseases”. With this intangible trust built up amongst the community of users, M3 is able to leverage this relationship with its members to develop new online tools. These include online tools in clinical trials to determine the feasibility of trials and help with patient recruitment, market research and survey panels, and online job search and career information site for member doctors and pharmacists. In China, M3’s membership for the healthcare professional portal site Medilive.cn topped one million members in August 2014 after just five years, covering roughly half of the physicians in China. M3 leveraged upon the media capacity of Medilive.cn to expand into “Messenger”, the Chinese version of MR-kun. M3 even expanded from B2B to B2C by providing a range of services for consumers including AskDoctors.jp, a subscription service that gives patients a chance to ask doctors questions about their ailments, and iTicket. M3’s Tanimura-san is what literary giant Saul Bellow would call a “first-class noticer”. Two entrepreneurs or value investors can study the same business model, watch the same video, or even take the same advice from a mentor, but the intensively-attentive and committed first-class noticer pick up critical details, opportunities and talents among noise that the other misses. Building on Bellow’s term, Harvard’s business psychology expert Max Bazerman studied why some people notice and act on threats and opportunities while others do not. Bazerman identified three core challenges to being a first-class noticer: (1) Ambiguity, (2) Motivated blindness due to ego or vested self-interest, and (3) Conflict of interest with our desires influencing the way we interpret information, even when we are trying to be objective, and others that include the slippery slope and efforts of others to mislead us. Develop the introspection and capacity for observation to discover just how you learn and then to get out and do it. Build in a process and attract people around you to challenge ambiguity, motivated blindness, and any conflict of interest to change you might have. Do it with intention. Intentionally establish a system to test your biases and comfortable assumptions. Have a growth mindset that makes reinvention of yourself a regular way of life. Notice the signs. Find a way to embrace them rather than avoid them. Be self-accountable. Do it now. Above all, the first-class noticer notices better because he or she cared more about their long-term journey than the shot-term paycheck. The intensive attentiveness is applied to a Purpose with an authentic Voice and the ability to engage others in shared meaning and to be truly aware of what’s going on in the world from wide-ranging and diverse sources of information. In the immortal words of leadership guru Warren Bennis, “the first-class noticer integrates a purpose with noble aims”. The first-class noticer devotes himself or herself to the Purpose and idea larger than themselves, being watchful and thankful. The word “watchful” is a legacy from the Old Testament – or a proactive sitting on a city wall and keeping watch. Watchmen were the first ones to see attacking armies or traveling traders. They saw things before others saw them. One of the world’s greatest and most inspiring first-class noticer and Bamboo Innovator is Kazuo Inamori. Born into poverty, Kazuo Inamori lost his family home at age 13 and almost died that same year after contracting tuberculosis. A religious neighbour handed him several Buddhist religious tracts, urging him to meditate on the meaning of life. As he meditated, his TB subsided. His reprieve left Inamori with the idea that he should strive for the betterment of humanity. Carrying this value in his heart, Dr. Inamori built two world-class companies from scratch in the course of a generation – global advanced ceramics company Kyocera (6971 JP, MV $20.6bn) (founded in 1959) and Japan’s second largest telecommunications firm KDDI (9433 JP, MV $62.8bn) (established in 1984), with a combined market capitalization of over $80 billion and employing over 80,000 kindred spirits. Through his commitment to society, which include the creation of the Nobel-class Kyoto Prize which honors contributors in technology, science, arts and philosophy by his Inamori Foundation, Inamori-san, 83, carries the voice of entrepreneurship on a global scale as the “Entrepreneur for the World”, an award he was presented with during the World Entrepreneurship Forum in 2009. After our chance encounter, N sent me an email that he aspires to build the “M3 of Southeast Asia”: “Uber became the one of the largest transport service company with no taxis. Alibaba became the world’s largest e-commerce company with no inventories. We hope our company can have a firm foothold in the medical industry without clinics”. The medical industry needs high reliability because of its mission to care for the life of human beings. This is the reason why M3 succeeded with the trusted platform, the “emptiness” of the trust and support from the community of pharmaceutical firms, physicians, and patients to generate stable and continued income with the option value and potential to expand their business based on the trusted platform. We wish N all the best in the pursuit of his aspiration – and to become a first-class noticer of business model innovations beyond the mere technical aspects of what makes a wide-moat compounder. Number four on the list – Commerce without morality – was poignant in accounting tunneling fraud that is increasingly prevalent in the Asian capital jungles akin to 2011. 2011 is the year when many Chinese stocks unravel in accounting frauds: Sino-Forest, Long-Top Financial, China Agri-Tech, ChinaCast Education etc. 2011 is the year of the shadow banking crisis rearing its ugly head, akin to the late 1990s, leading to a tightening in credit conditions, which in turn resulted in companies finding it more difficult to opportunistically use the roll-away “other receivables” and loan guarantee accounting tunneling trick with cheap money. As we have explained in an earlier article “Shedding of the Asian Snake’s Skin: The Opportunistic Tunneling of Corporate Wealth”, loan guarantee presents a seemingly innocuous Opportunity to maliciously tunnel out corporate wealth in Asian companies. Take the case of Olympus. It deposited ¥21bn in Japanese government bonds with LGT Bank and arranged for the bank to use these bonds as collateral for a loan to two shell companies, the “tobashi”. The unconsolidated shells in turn used the borrowed funds to buy the toxic investments from Olympus at the original cost. Olympus recorded the amount it deposited with LGT and the toxic assets were considered “sold” to the shells, thereby avoiding recognizing massive losses on these underwater securities. In other words, Olympus acted as a guarantor of loans made by the banks to the shells by depositing funds at the banks equal to the amount loaned. 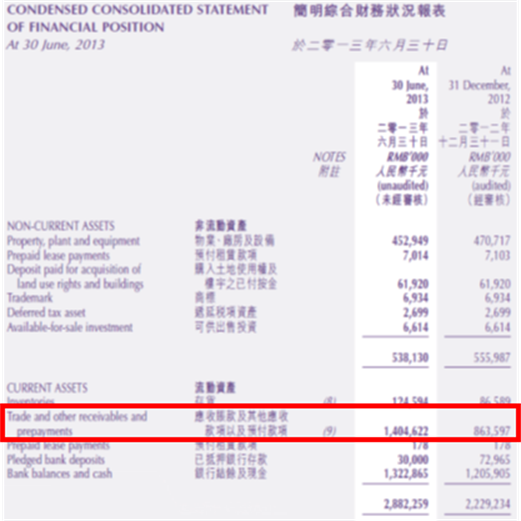 If the related-party nature of the transaction was disclosed, the ¥21bn will be recorded as a financial liability in the balance sheet. In China and Asia, the loan guarantee accounting problem to undisclosed related parties has shifted to intercorporate loans, classified under “Other Receivables”. With some reforms mitigating these RPTs, the Asian Snake has adapted and shifted to other accounts in disguised forms. Hence our earlier article for a sense of urgency to develop a new composite measurement of accounting tunneling fraud. Hence, cash in the balance sheet in Asian companies is invariably never really cash unless one examines these related-party transactions (RPTs), often held in scant regard by investors using western-style financial statement analysis and by Asian auditors. Potential impairment in the fair value of the financial guarantee contracts given to banks on the borrowings of its subsidiary Shandong Taifeng Textile given to “independent third parties” (possible related-parties?). Likely impairment in the fair value of the estimation of the recoverable amounts of the Group’s assets, including other receivables and loans receivables of RMB480m. Below is the interim 2013 report announced on Sep 12, 2013 when its share price was HK$1.55 (now HK$1.08). One can notice that the trade and other receivables and prepayments as at 30 Jun 2013 is RMB1.4bn and the corresponding footnote only discloses the trade receivables amount of RMB836m, totaling omitting the “other receivables and prepayments” of RMB568m. This amount is subsequently the source of the audit failure announced on 31 Mar 2015, a year and a half later. By FY2013, the amount of these “other receivables, prepayment to suppliers, prepayment for operating expenses, loan receivables” has exploded to RMB1bn! As Gandhi points out with his wisdom, Commerce without Morality leads to Violence and Accounting Fraud. Commerce would not have progress beyond the barter system without the invention of a system of weights and measures. Before there was the traditional Chinese steelyard (gancheng), buyers and sellers eye the heap of goods to determine their weight. It is difficult to achieve a fair trade. With the gancheng, the object to be weighed hangs at one end of the beam, while the weights at the other end are slided left or right until a perfect balance of the beam is found. Reading of the mark where the weight-string rests is made to determine the weight of the object. There are 16 markings on the arm of a gancheng, such that 16 qian is equivalent to 1 liang and 16 liang is equivalent to 1 jin (or 604.79 grams). The Chinese unit of measurement was based on the number 16 instead of 10. 16 is the sum of 7, 6 and 3. 7 stands for the Beidou Seven-Star Constellation, which symbolizes the need to have the right direction in our heart when we use the measurement tool to make money and not be too greedy. 6 stands for the directions North, South, East, West, Up, and Down, which cautions us to stay centered in our ethical principles when making money. Lastly, 3 stands for Fu (Good Fortune), Lu (Prosperity), Shou (Longevity). When we make money by squeezing one liang improperly out of others, we lose Shou (Longevity); wrench two liang and we lose Lu (Prosperity). Give money back to the customers and society in a sustainable way and we gain Fu, Lu, Shou. Thus, the 16-unit scale is not merely a tool to measure and make money, but more importantly, it is a scale to guide and measure our values in life and in business. To rephrase Gandhi’s talisman, commerce is not merely about the measurement of the weight of profits collected in multiple clever transactions to build abstract personal wealth. Only in the endeavor to perform first for customers, and serve them with the highest possible integrity and character, can commerce find its foundation for durable business success and create society’s abundance. PS2: This is a double-issue for April 6 and April 13. We will be back with the weekly on April 20. In the meantime, we will be uploading value-added content such as potential accounting fraud reports that include Rexlot and actual accounting fraud cases such as Malaysia’s Transmile for our Moat Report Asia paid subscribers. Mr. Jarrod Baker, the Senior Managing Director at NYSE-listed forensic specialist FTI Consulting Inc (NYSE: FCN, MV $1.5bn).